Comprehensive review of Alba Sunless Tanner. See what real experts and actual users have to say about this self tanning product. Overall, this is a great product. I gave it 3.75 out of 5 stars, it’s definitely better than your average self tanner. The application is easy, and the great thing is- it isn’t messy at all. There’s no guide and the lotion is thick enough that is doesn’t drip all over. It’s a medium shade that gives you a bronze natural glow. I personally liked the smell of the product, it smells tart. But you can also smell the DHA a bit, which I didn’t like. The product lasted around 3 days, which is average. Then it starts to fade, but at least it fades naturally! And lastly, you can’t beat the price. At only $2.75 an ounce, this is definitely one worth trying! Alba Sunless Tanner is a thick white lotion, it looks a lot like sun screen. The texture is very creamy and smooth and is very easy to apply. It feels like a thick body moisturizer. This product is hassle free as far as application goes. It’s white in color, so you don’t have to worry about staining anything. Make sure to thoroughly wash your hands after applying though. The texture is definitely very thick and creamy, so it does take a few seconds to fully blend into your skin. Alba Sunless Tanner dried completely in about 25 minutes. I thought it was going to take longer to dry due to the thickness of the product, but I was pleasantly surprised. I was able to sit on the couch while this was drying as well, because I didn’t have to worry about it staining it. That was nice! I like the smell of this product, but there is definitely a hint of DHA in it. The product smells sweet and tangy, and it reminds me of the way sunscreen smells. This is one that I’m not sure everyone will like the smell of, but I enjoy it a lot. You can smell the DHA in the product, but it’s not too overwhelming. The next day, the product smelled slightly tangy on my skin, but any hint of DHA was gone. And after I showered the tangy smell went away as well. So the smell didn’t last very long, which I was bummed about. I was really impressed when I saw the color the Alba Sunless Tanner produced. Usually tanners in this price range produce less than stellar color. But this one is great! The color is a nice medium shade that looks extremely natural. It didn’t look orange at all, the color was a bronze sunkissed glow. Everyone who knows me know I like my self tanners super dark, so I wouldn’t complain if this one was a few shades darker. But overall, I was really impressed with the natural, medium shade it produced. Alba Sunless Tanner lasted around 3 days, then it started to slowly fade. I’d say you’ll have to apply this one 2 times a week to maintain noticeable color. After 3 days it started to fade, but thankfully it didn’t fade splotchy. Yes! I think this is a winner for men. The color is a great shade for them, not too dark, not too light. The drying time is about average, and the application is simple. The smell is a little girly, but that goes away the following day. At $2.75 an ounce, Alba Sunless Tanner is on the cheaper side. It goes for $10.99 for a 4 oz. bottle, so I’d say that’s a pretty good deal! 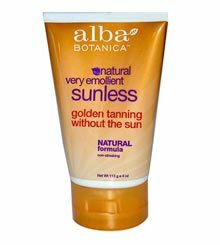 To buy Alba Sunless Tanner, Click Here. Look and Feel It comes out as a thick, white lotion. There’s no guide. Application Application is painless and simple. There’s no mess. Drying Time Alba Sunless Tanner dried in about 25 minutes, which is pretty average. Smell (Before) I liked the smell. It smelled sweet and tart, with a hint of DHA. Smell (After) The next day I could smell a hint of the product, but the DHA smell was gone. Color Produced It produced a medium, natural looking tan. The color was bronze and smooth. How Long It Lasts It lasts about 3 days, that is average. You will probably have to apply this one twice a week. OK For Men? Yes, the color is great and application is a breeze. You also can’t beat the price point! Price The 4 oz. bottle sells for $10.99, That works out to $2.75 an oz… very affordable!